NOTE: If you're using passwords in shell scripts, see Daniel Jalkut's reply below about using OS X's built-in security command instead of his AppleScript library. One of my goals for the new year1 is to be more security minded in my use of technology. This is a broad statement, but I have some very specific points in mind, including more regular use of a self-hosted VPN (the topic of a future blog post) and avoiding the bad habit of using passwords in shell scripts (the topic of this blog post). Daniel's blog posts explain his personal motivations for writing and updating Usable Keychain Scripting, but I first discovered the application when Apple removed keychain scripting from Lion, thus making it impossible to access keychain entries with AppleScript. His utility fills that niche for me, though as mentioned, I don't use it as often as I should. The first step is to create a password entry in Keychain Access. The main consideration here is that although multiple keychain entries can have the same name, it's difficult (and more work) to distinguish between them in an AppleScript. Thus, it's best to ensure the entry has a unique name. 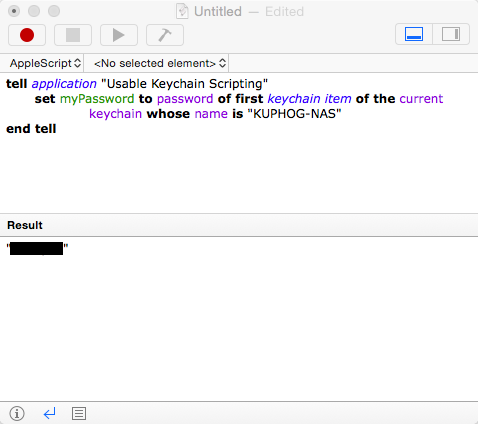 Then the Usable Keychain Scripting AppleScript library should be tested within Script Editor. 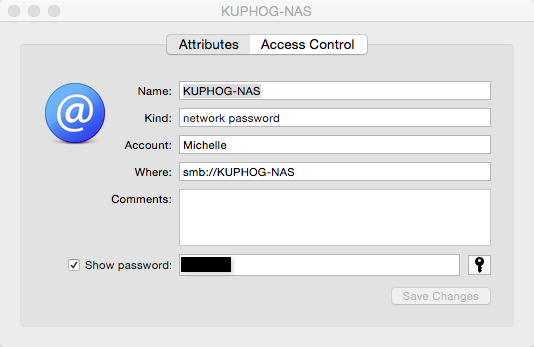 This is important because your login password has to be entered the first time this AppleScript library is accessed, and the password entry window doesn't always work from a shell script. set myPassword to password of first keychain item of keychain "/Users/mlgill/Library/Keychains/login.keychain" whose name is "KUPHOG-NAS"
set myPassword to password of first keychain item of the current keychain whose name is "KUPHOG-NAS"
set myPassword to password of first keychain item of current keychain whose name is "KUPHOG-NAS"
That's it! Here's to a more secure 2015!